Today there is a Design Team Reveal up on the Just Imagine Crafts/Kreaxions Punches Blog. The theme was flowers. I created the flower on this card using the Circle Cutter (one of my favorite tools). The border strip was made using the Kreaxions 4 in 1 punch #310 with no insert. Be sure to check out the Just Imagine Crafts/Kreaxions Punches Blog to see what the rest of the Design Team did. It’s Friday and I have a project up on the Just Imagine Crafts/Kreaxions Punches Blog today. I made this cute little card using the Kreaxions 4 in 1 punch #904 with no insert. I punched a strip of white paper on both sides with the punch. I then cut the edges of the punched strip off and used them as the flap for the blouse. Adding the pearls as buttons finished the card. Such an easy card to make … yet the punch work makes a big statement. Be sure to check out the Just Imagine Crafts/Kreaxions Punches Blog to see what the rest of the Design Team has been up to this week. I have a design team project up on the Just Imagine Crafts/Kreaxions Punches Blog today. I have a long list of crafty techniques and ideas that I would like to try someday. I finally got to check one of those ideas off my list … a Z fold card. The perfect way to finish the card off was to punch the edge with the Kreaxions 4 in 1 punch # 918 with no insert. With all the personal die-cutting machines on the market, the options for using die cuts on your scrapbooking/paper crafting projects is endless. Die cut titles can be custom made to match your project and are easy to make. I have a challenge up at Turtle Soup for the May Mini Crop. Be sure to check out the details in the forum. 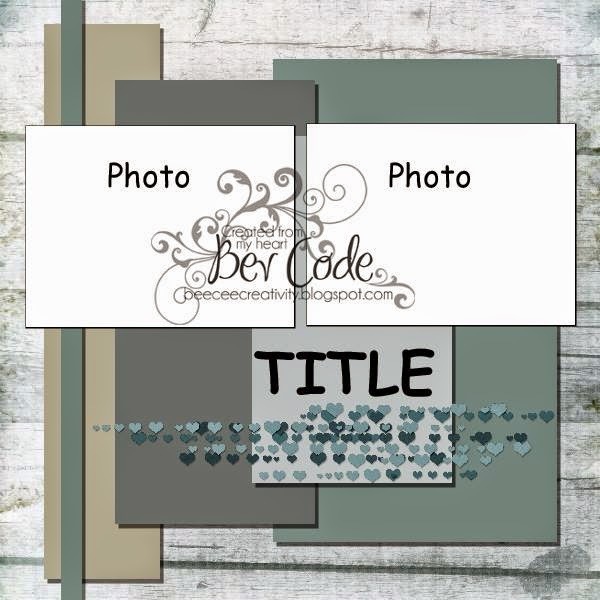 My challenge is for you to create a layout, card, tag, ATC or altered project and use a die cut title on it. Can’t wait to see what you come up with. For this layout I used my Cricut and the Graphically Speaking cartridge. Using the oversized die cut title on this page makes a BIG statement. I’m beyond EXCITED that I made the Off The Rails Scrapbooking Design Team! Be sure to check out their blog to meet the rest of the new design team and to see their inspiring work. I finally had some time to get out my “messy” supplies … oh how I love to play with them. And what’s even better is that all of these supplies where in my stash. 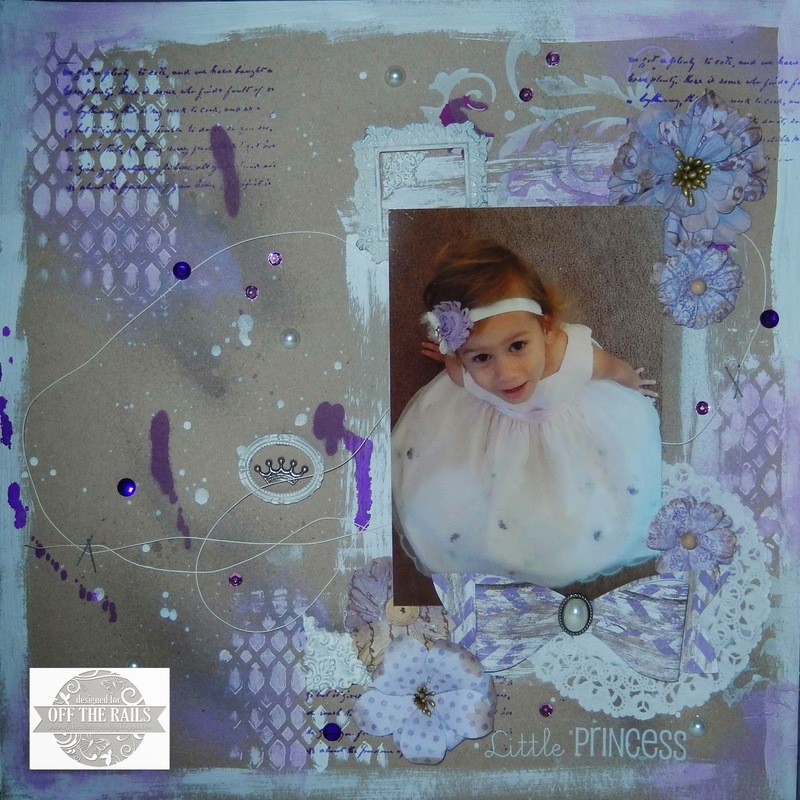 So with an adorable photo of Gracelynn, a piece of Kraft cardstock, some Gesso, a stencil, Modelling Paste, Tattered Angels Glimmer Mist, Versa Magic Chalk Ink, Alcohol Ink and some Prima resin frames and treasures along with some flowers from The Paper Studio (and a little of this and that) … voila! I have a layout fit for a princess. There is a Design Team Sketch Reveal up at Turtle Soup today. Bev Code provided us with another amazing sketch to work with this month. and Tattered Angels. Be sure to check out the Turtle Soup Forum to see what the rest of the Design Team did with the sketch. 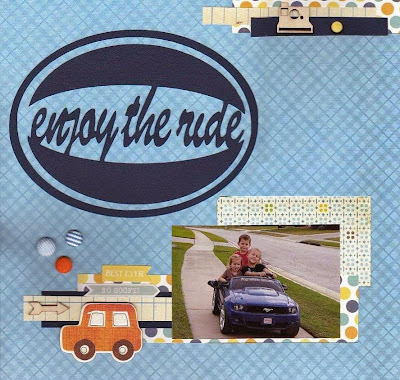 1) I’m more than a little excited to have made the Off The Rails Scrapbooking Design Team! I’m looking forward to working with this group of amazing designers. 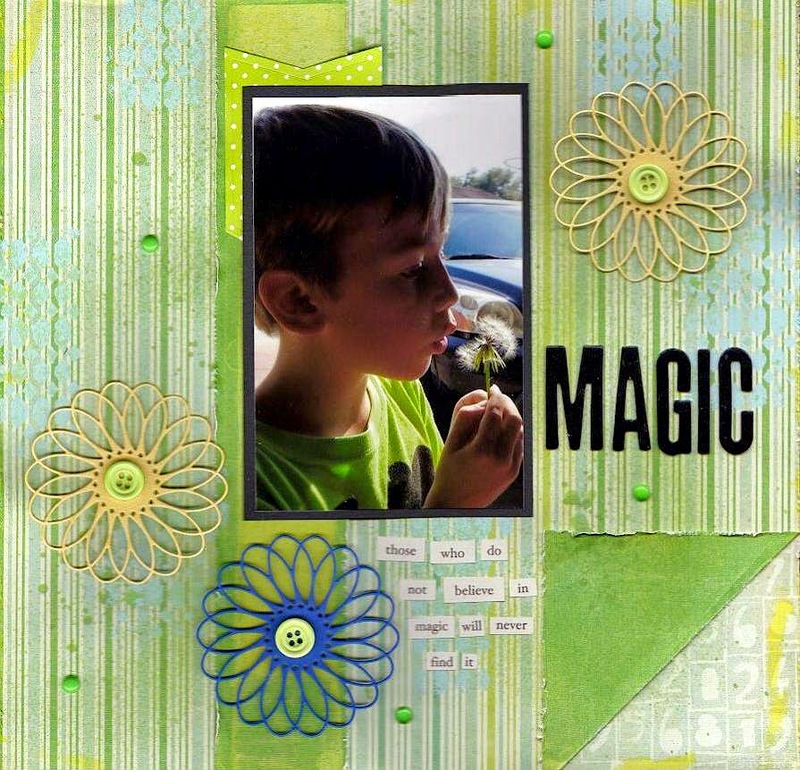 Be sure to check out the Off The Rails Scrapbooking Blog for the challenge details and to be inspired by the rest of the design team. 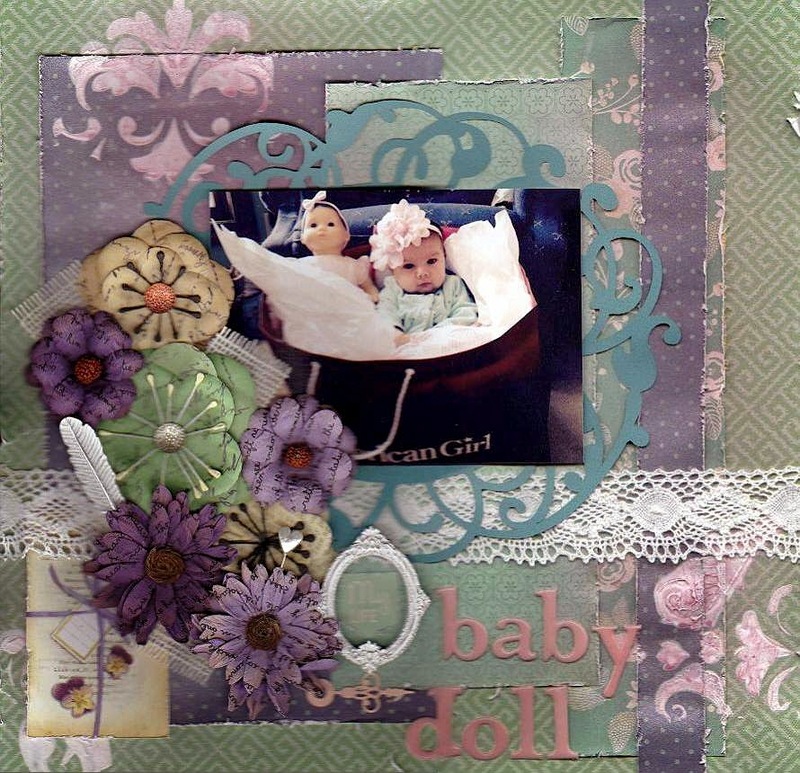 2Crafty Chipboard is the sponsor this month. They are offering the lucky winner a mixture of their gorgeous chipboard. Below you will find the May Challenge Mood Board. When I saw the colors I knew exactly what photo I would be using on my layout. I love this sweet photo of my son Jesse and grandson Vincent. So with the perfect photo, some Gesso, paint, ink, a stencil, a stamp and some embellishments from my stash I got to work. I created a funky page with a little retro vibe going on. 2) I have a Design Team project up on the Just Imagine Crafts/Kreaxions Punches Blog today. 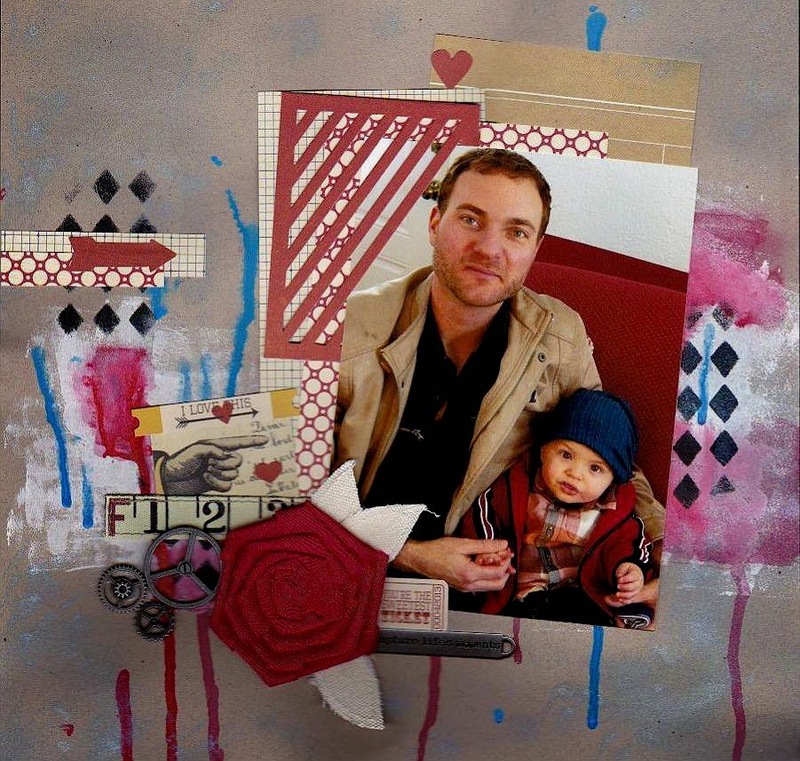 I created this page for Sweet Baby Isabella’s album. I used the Kreaxions 4 in 1 punch #303 with no insert to create the border strip behind the photo. I used the circle cutter, the B Stencil and the Kreaxions 4 in 1 punch #905 with the 6.8 (small) Positioning Parts to create the doily. I love all the detail these punches add to a project! The perfect heart punch for this "Sweet Baby" page. 3) In honor of National Scrapbooking Day I have a challenge up at Turtle Soup. Be sure to check out the forum for the challenge details and the rest of the challenges from the design team. 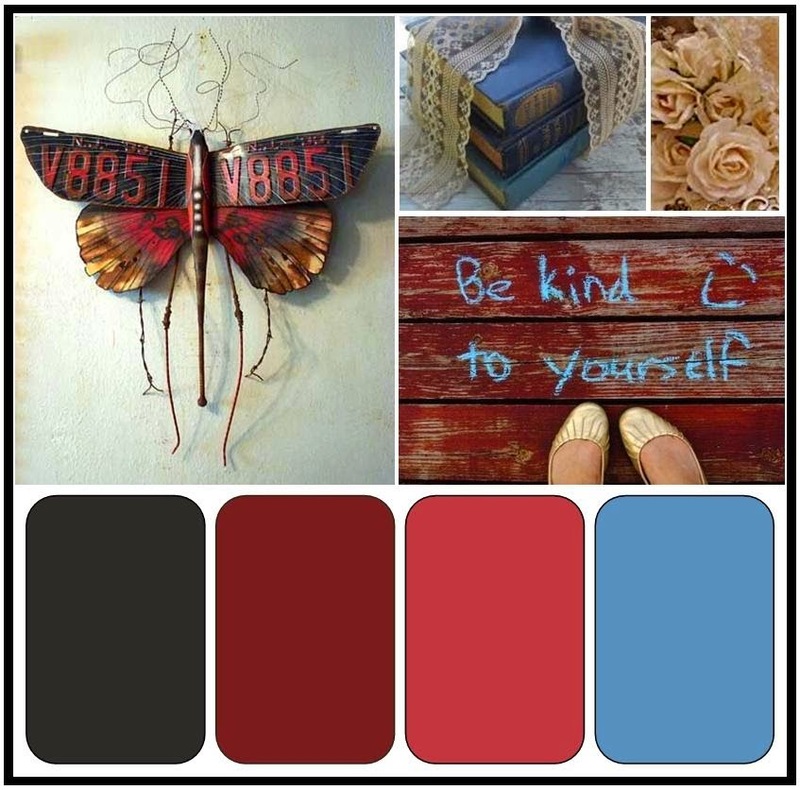 I love using paint on my scrapbooking pages. Paint is inexpensive, readily available and easy to use. It’s also a fun way to add an artistic edge to your pages. For this page I added paint to my Gesso. I then used a stencil and randomly applied the tinted Gesso. I also used some chalk paint to make splatters on my page. So use some paint on your project and create some magic!